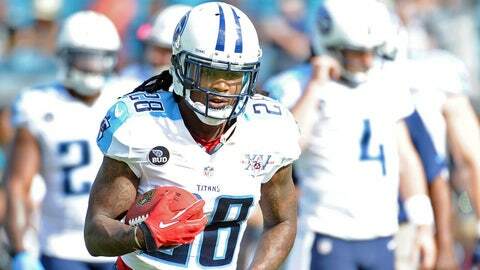 Titans running back Chris Johnson is due $23 million over the next three seasons. NASHVILLE, Tenn. — As the Tennessee Titans close a disappointing season Sunday against visiting Houston, there is conversation about which veteran players will return next season — and which ones will not. It is pretty much a given that fifth-year wide receiver Kenny Britt, the 2009 first-round draft pick who was expected to be the team’s lead receiver, won’t return after his initial contract expires at season’s end. This year, he has only 11 catches for 97 yards and no touchdowns, including being inactive despite being healthy two of the last three games. Another Titan who might not return is sixth-year running back Chris Johnson, although his contract runs through 2016. After gaining only 950 yards at a career-low 3.8 yards per carry and scoring just five touchdowns thus far, the 2008 first-round draft pick might not be worth the $8 million due each of the next two seasons and $7 million in 2016. 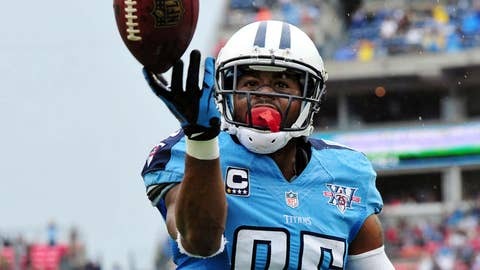 One veteran stating his case for a return to the Titans’ roster for a sixth season (10th NFL season overall) is veteran wide receiver Nate Washington. Among his team-highs of six catches for 117 yards in last Sunday’s 20-16 win at Jacksonville was a 30-yard game-winner from quarterback Ryan Fitzpatrick in the fourth quarter. "We have one more game left, so the season is not over," Washington said of finishing the season with consecutive wins for the just the second time this season. "We have another game we need to win." After posting his third 100-yard receiving game of the season against the Jaguars, Washington has 56 catches for 880 yards for 15.7 yards per catch and three touchdowns. But he’s also due to make $4.8 million in 2014, the final year of a six-year deal with the Titans, and he has reportedly stated he would not consider renegotiating his contract. Meanwhile, Washington has been the senior member of a receiving corps that features second-year Kendall Wright, who tops the team with 89 catches and 1,029 yards. Rookie Justin Hunter has also shown promise with a pair of 100-yard receiving games. "He’s been a great example to that room, to those young receivers, to our team. I’m glad to see him playing so well, especially in a game where we needed him to make some catches for us," Munchak said of Washington, who became the first Titans receiver since Drew Bennett in 2006 to have three 100-yard games in a season. "He’s had two games back-to-back where he’s played well, running some great routes, looked quick and fast." Including four seasons with Pittsburgh from 2005-09 before joining the Titans in 2010, Washington has 5,610 yards and 38 touchdowns in his career. The Titans (6-9) snapped a three-game losing streak with last Sunday’s win — all a part of a season that included losing seven of nine games after starting out 3-1. The Titans have also lost five straight at home, most since moving from Houston in 1997. In the win over Jacksonville, the Titans finally got the offensive balance they had been seeking all season long. And that started with the running game accounting for 182 yards, second-highest of the season behind only the 198 gained in a win at St. Louis on Nov. 3. Those numbers were spread nearly equally between running backs Chris Johnson (90 yards on 22 carries) and Shonn Greene (season-high 91 yards on 19 carries). The 44 rushing attempts were the most for the Titans since 49 against Jacksonville on Nov. 11, 2009. "I would love to be able to do that every week," Munchak said of having the two-pronged running attack of Johnson and Greene, who has been slowed by injury. "I hope we would go out and have success creating third-and-2s and third-and-3s to where we can convert easier rather than losing yards or having no gain. "That’s what we hoped we would be able to do, get both of those guys going, so we’ll be trying to do that this weekend (against Houston) if we can." Meanwhile, quarterback Ryan Fitzpatrick completed 17 of his 26 passes for 181 yards. That came one game after he amassed career highs of 36 completions, 58 attempts and 402 passing yards, plus matching a career-high four scoring passes, in a home loss to Arizona. Veteran receiver Nate Washington has posted three 100-yard receiving games this season. With Christmas Day falling on Wednesday — the day the team returns to practice after taking off Tuesday during a normal game week — Munchak shifted the schedule this week to allow players, coaches and staffers the opportunity to spend more time with family and friends. The team had a short work session Tuesday morning before returning for another half day of work on Wednesday afternoon. The team will be back at it full time on Thursday. "They’ll have Christmas Eve, free time there, then they’ll come in at Christmas about one o’clock, 12 o’clock, and have the same thing, another half day Wednesday," Munchak said of his plans earlier in the week. "We’ll be done about five o’clock Wednesday. Guys can be home in the morning with their families and obviously be home for dinner, too. "I thought that worked out well with the 24-hour window there, a window there, and in the meantime we can still get our work done for Wednesday with the stuff we need to do as far as Houston goes. It works out for everybody, and then we get back on Thursday with a normal schedule." Munchak said the team no longer being in the playoff hunt had no impact on the scheduling this week around Christmas. "These kind of schedules, I kind of wait to see what the situation is, the health of your team, where you’re at," he said. "I would do the same schedule. We end up having more meeting time because we’ll go Tuesday. Normally we’re not talking about Houston on a Tuesday afternoon. We’ll already be doing that. We’ll get about three or four hours of work there and come back and get four or five hours the next day, so we’ll get plenty of work in on Wednesday as far as preparation. We’re back on Thursday and Friday, so it should work out good either way." The deadline for fans to vote for Pro Bowl team members is Thursday, and third-year Titans defensive tackle Jurrell Casey said he hasn’t promoted himself for a spot. Then again, he leads the team with 10.5 sacks, which is tied for the NFL lead among tackles with Buffalo’s Kyle Williams (11th overall in the league). "No speeches for me," Casey said. "If I’m in, I’m in. If I’m not, I’m not. That’s the way it goes." Casey injured a knee in the win over Jacksonville and his status for Sunday’s game against Houston will be judged later in the week. "I’ll go out there (the rest of the week) and see how everything is feeling," Casey said, "and if it’s all working out, then I’ll be out there Sunday." Other top Pro Bowl candidates from the Titans include wide receiver Kendall Wright and cornerback Alterraun Verner. Wright’s team highs of 89 catches and 1,029 yards ranks fifth and eighth in the AFC, respectively. His 29 third-down receptions are tied for third in the NFL. Verner’s team-high five interceptions is tied for the AFC lead and fourth in the NFL.